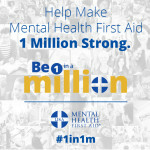 Let’s make Mental Health First Aid as common as CPR. Find a course near you today! 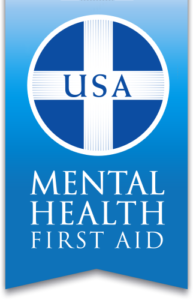 The American Foundation for Suicide Prevention (AFSP) is dedicated to saving lives and bringing hope to those affected by suicide. AFSP now has local chapters in all 50 states with programs and events nationwide. We encourage you to get involved in your community, connect with those around you, and help raise funds to support programs that promote suicide awareness, education and prevention. 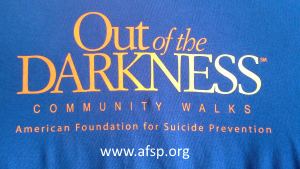 Participating in one of AFSP’s Out of the Darkness Walks is a great way to make a difference. Campus Walks are held in the spring. Community Walks are held in the fall. Overnight Walks are held twice a year in large cities across the country. In 2018, they will happen June 2 in Dallas, TX and June 16 in Philadelphia, PA. 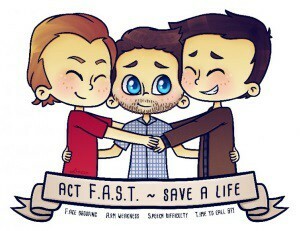 In October 2013, Rob Benedict (lead singer of Louden Swain/Chuck on Supernatural) suffered a stroke near the end of the Supernatural convention in Toronto (TorCon). In honor of Rob’s recovery, we are encouraging everyone to recognize and respond to the warning signs of a stroke FAST: Face drooping, Arm weakness, Speech difficulty, Time to call 911.